The figure used for this unit is a Star Wars figure from the Universe set. Its model number and name are #50/Princess Leia, Rebel Hero. The figure used for this unit is a Star Wars figure from the Rebels and Imperials set. Its model number and name are #05/Princess Leia, Rebel Hero. Character Bio - After the destruction of her home planet of Alderaan, the rebellion itself became Leia Organa's home. As a capable leader, she rose through the ranks quickly and was increasingly relied upon. Her diplomatic skills and contacts, gained during her time as a one time member of the Imperial Senate, provided her with valuable knowledge and resources the Rebellion put to use recruiting new allies for the cause. In this role she proved quite capable at turning former rivals and adversaries into assets. This was perhaps in part because she also did not hesitate to jump directly into the fight herself, stepping up to save her allies or the mission again and again. The 'F' symbol in the lower left-hand corner of the card signifies this figure is force sensitive. We added this ability so we can reference all figures with the Force and it does not have any powers attached to it. Q: Can you use Somebody's Got to Save Our Skins to move an order marker from a card whose figures have all been destroyed to a different card? A: Yes. An army card whose figures have all been destroyed is still in your army. Being a figure with the Force Sensitive symbol, Leia Organa is eligible to benefit from Obi-Wan Kenobi's JEDI MENTOR and FORCE SPIRIT special powers. Being a non-droid or vehicle hero that follows the Rebel Alliance, Leia Organa may benefit from 2-1B's REBEL FIELD MEDIC special power. 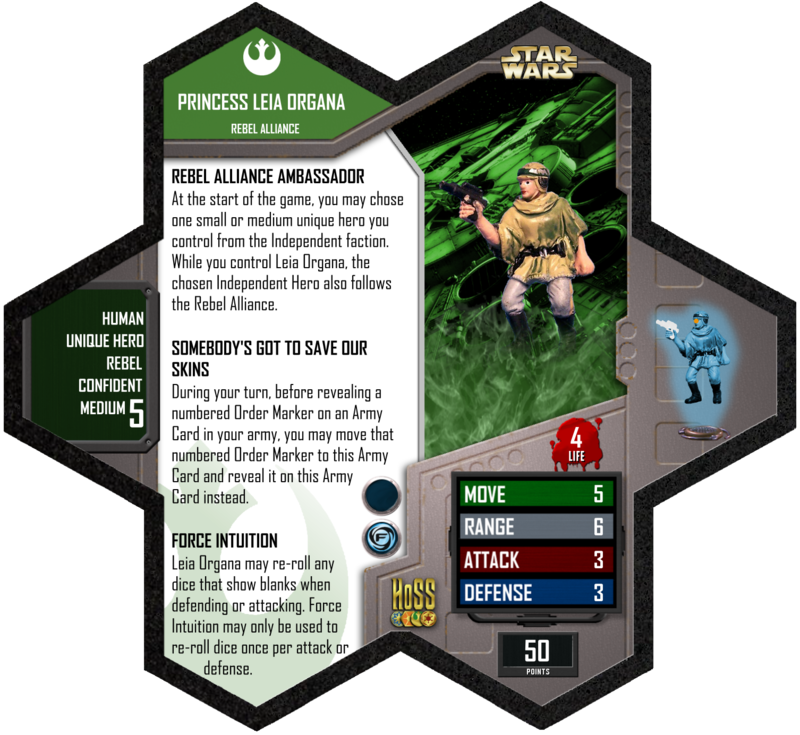 • As the Rebel Alliances' Ambassador, Leia can bring some powerful Independent heroes into the Rebel synergy web. From bonding with General Han Solo to healing with 2-1B, this could prove a fearsome combo in some opponents' eyes. However, the weak link in this chain is Leia herself as once she is removed from play the temporary alliance falls apart. So should you find yourself facing down a Rebel aligned Boba Fett, prioritize taking down Leia first and cut the ties that bind them together. At the start of the game, you may chose one small or medium unique hero you control from the Independent faction. While you control Leia Organa, the chosen Independent Hero also follows the Rebel Alliance. During your turn, before revealing a numbered Order Marker on an Army Card in your army, you may move that numbered Order Marker to this Army Card and reveal it on this Army Card instead. 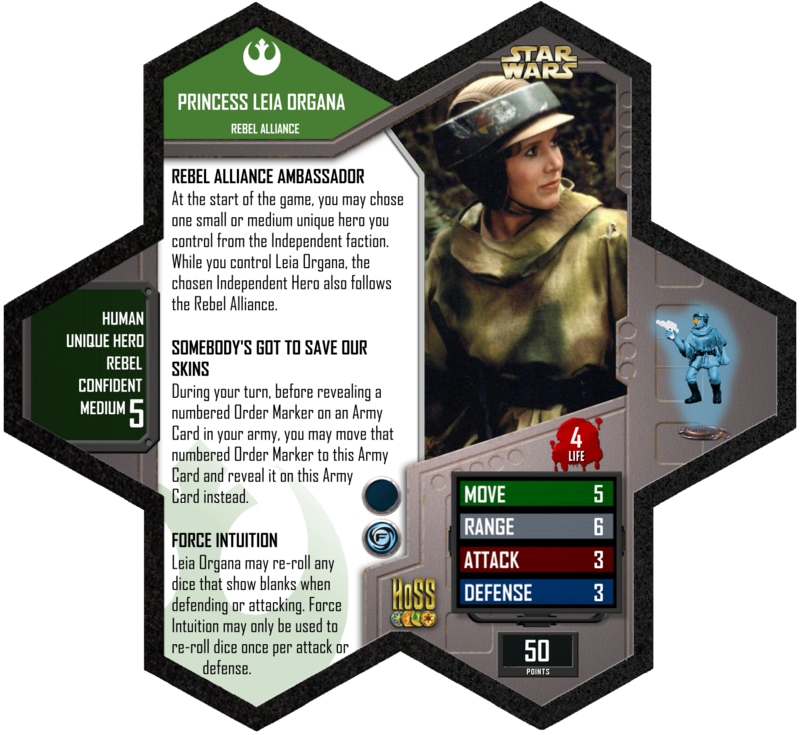 Leia Organa may re-roll any dice that show blanks when defending or attacking. Force Intuition may only be used to re-roll dice once per attack or defense. Last edited by Yodaking; September 29th, 2017 at 10:32 PM. Leia is missing a targeting point on her card. Not anymore. Thanks for the heads-up.